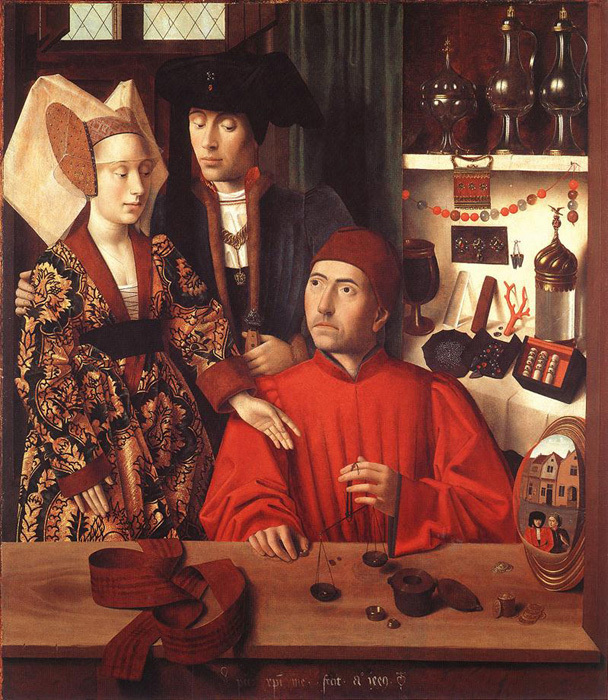 Petrus Christus, The Goldsmith, 1449, New York, The Metropolitan Museum of Art. The earlier Middle Ages divided society into just three categories: those who fight, those who pray, and those who work. A Romanesque manuscript illustrates the tripartite division of society. While the first two categories were in uneasy balance during the early Middle Ages, the third category was clearly subservient to the first two categories. The Aristotle illustration above reflects the greater social complexity and significant shifts in power during this period. 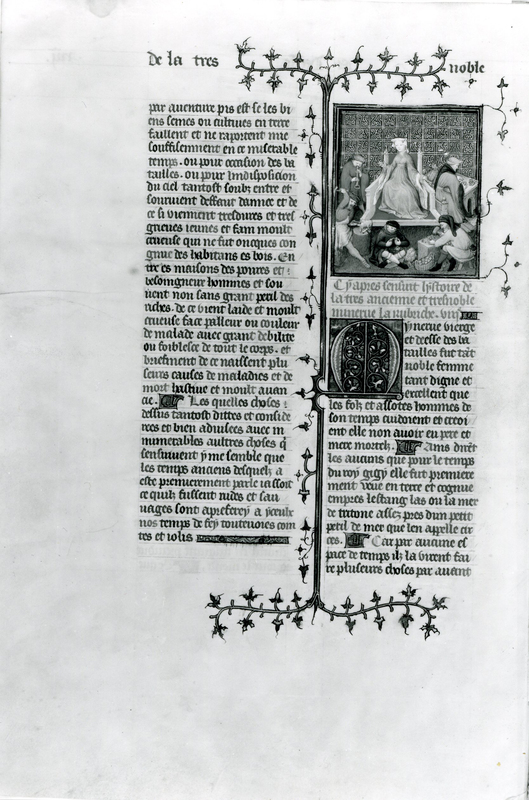 In this text which was originally made for the king of France, Charles V, priority is given to the world of royal power which was based on military power (gens darmes) and an effective bureaucracy (gens de conseil). 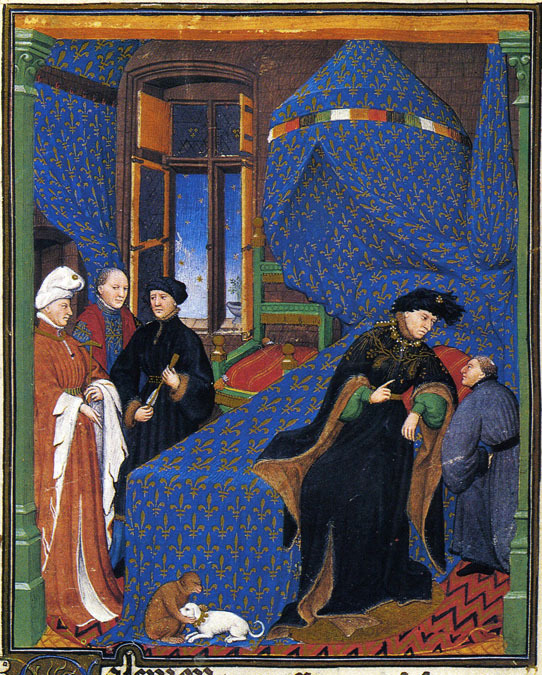 The secondary position of the clergy (gens sacerdotal) reflects in part the perspective of the patron but also reflects the significant development of national monarchies during the later Middle Ages. 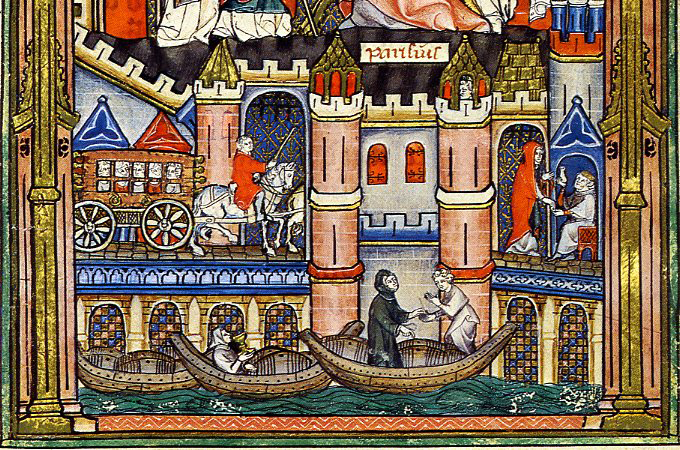 The last two categories, the artisans (gens de mestier) and the merchants (marchans), were not present in the earlier Middle Ages. Their being grouped together reflects their different basis of power. 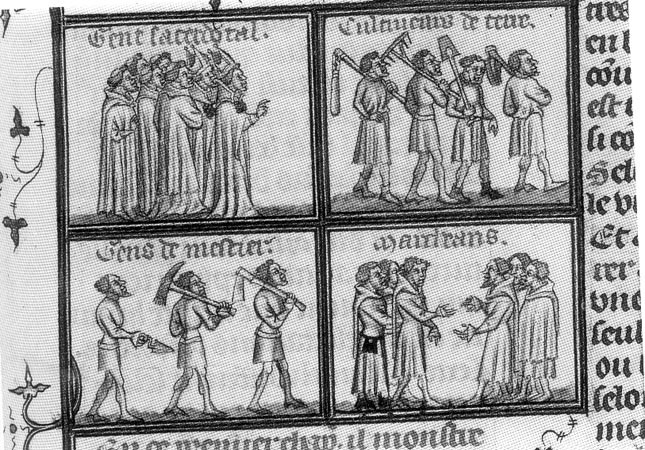 The peasants (cultiveurs de terre) are still grouped with the upper categories. This reflects their dependency on these categories. They worked as laborers on the lands of nobility or of the church. Operating in the developing towns, the artisans and merchants based their economic and social independence on the money based economy. 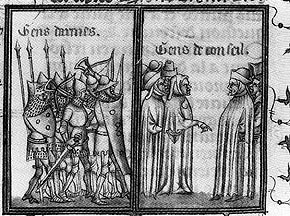 Life of St. Denis, presented to King Philip V in 1317. 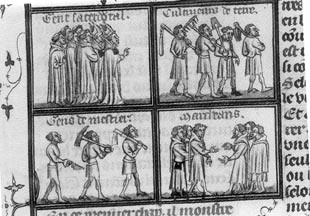 An early fourteenth century manuscript of the Life of St. Denis illustrates well the shift to the money economy and the activity of the artisans and merchants. At the bottom of its miniatures appear illustrations of the commercial activity on the bridges of Paris that linked the Île de la Cité to the Left and Right banks of the Seine. 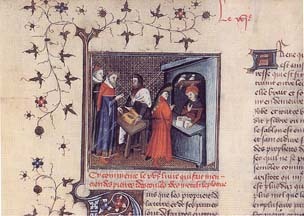 The miniature above shows a wine merchant haggling with a customer while another customer tastes the quality of the vintage. A physician on the Petit Pont examines a urine specimen in exchange for the payment by the patient. The wagon with passengers reminds of the importance of travel at this period which revitalized the economic, intellectual, and artistic life of the period. 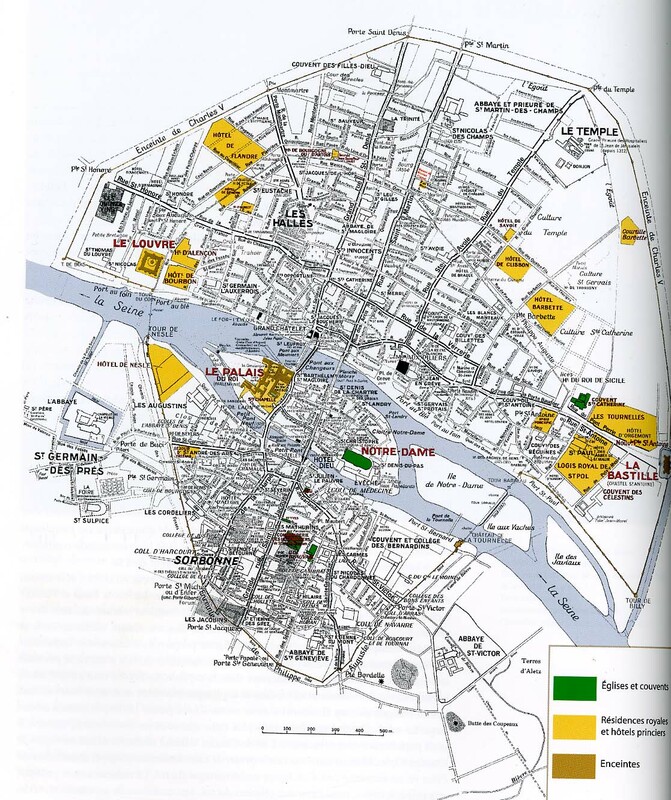 Paris had become a center attracting influences from throughout Europe. Common concerns of the craft guilds were the protection of members from outside competition, ensuring fair competition between members, and maintaining standards of quality for the product. Only masters in the trade would generally be allowed to sell the product or to employ others to produce. To become a master one would have to meet a number of criteria including being a member or burgess of the community, to have completed an apprenticeship in the trade, and to have paid an entry fee to the guild. The status of burgess (or bourgeois) was distinct from that of a native or resident of a community. As a burgess, one was entitled to full municiple rights which usually entailed participation in government, judicial benefits, and freedom to trade. For the craftsman becoming a master not only signified mastery of the craft but also an attainment of a social standing above that of the majority of the population of a community who were mere natives or residents. There would frequently be reduced guild fees for the children of masters. This led to the continuity of family dynasties in particular trades. Many guilds had the stipulation of producing an example of the trade, or masterpiece, to demonstrate mastery (see the excerpts from Walter Cahn's book Masterpieces: Chapters on the History of an Idea). 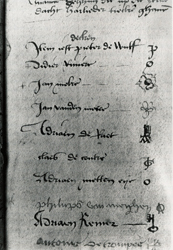 Members of the clergy and individuals who were in the employ of a ruler were usually exempted from these regulations. In many communities the numbers of practitioners in a particular trade were not sufficient enough to form their own independent guild. These trades would then be allied with other trades that were comparable in materials or skills. A famous example is presented by the case of the painters in Florence that belonged to the guild of the doctors and apothecaries (Arte dei Medici e Speziale ). To the modern observer this does not make a lot of sense until it is remembered that painters depended on materials only available through the apothecaries to make pigments like the fine lapis lazuli stone to make the highest quality blue. Crafts that to the modern observer would appear to be related would appear in separate guilds. A good example is presented by the painter's guild in Paris. One might expect to find among its membership the names of known miniaturists, but in fact miniaturists belonged to a separate organization. Red dot on the map marks the spot QTVR on the left was taken. 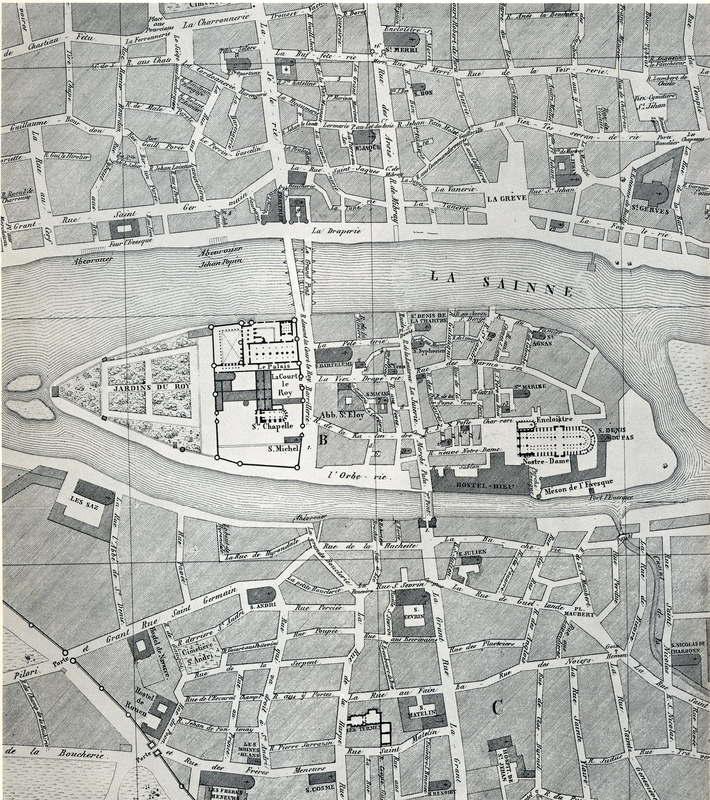 It is the intersection of what is now the Rue de la Parcheminerie and the Rue Boutbrie. 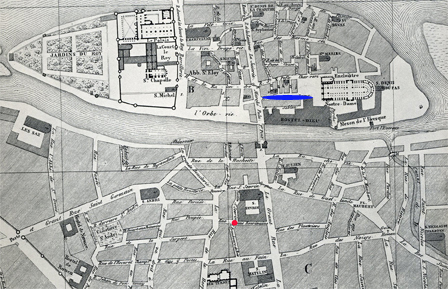 The Rue Neuve Notre Dame is marked in blue. 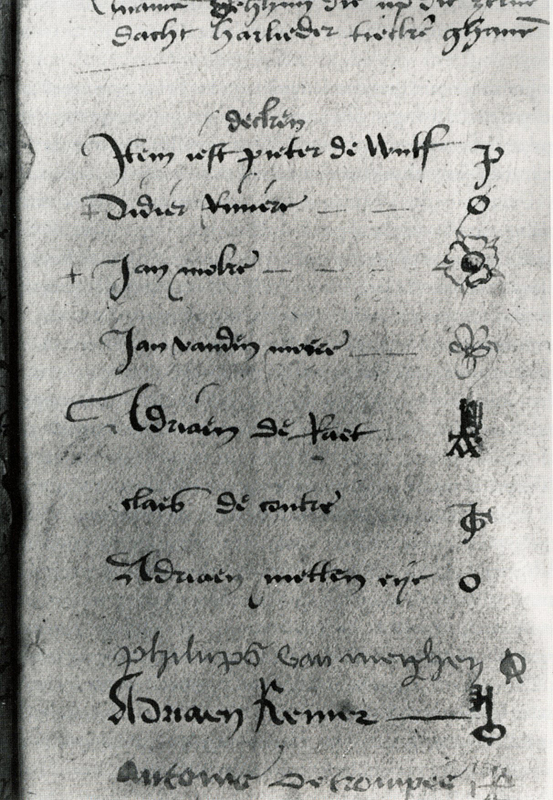 The manuscript industry was focused around the church of St. Severin where parchment was sold. This is reflected in the current name of the street just to the south of St. Severin, the Rue de la Parcheminerie . In the Middle Ages this street was also called the rue aus éscrivains, or the street of the scribes. The street intersecting the rue de la Parcheminerie is now the rue Boutbrie, but in the Middle Ages was frequently called rue des enlumineurs, or the street of the illuminators. Records from the Middle Ages make it clear that many of the participants in the book industry lived in this neighborhood. 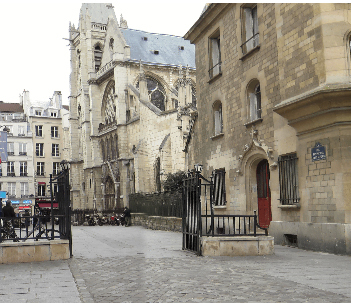 The streets around Notre Dame continued to be the sites of book production. 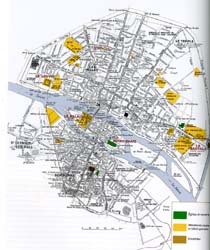 The Rue Neuve Notre Dame that begins just to the west of the cathedral is frequently mentioned as a location for book makers. 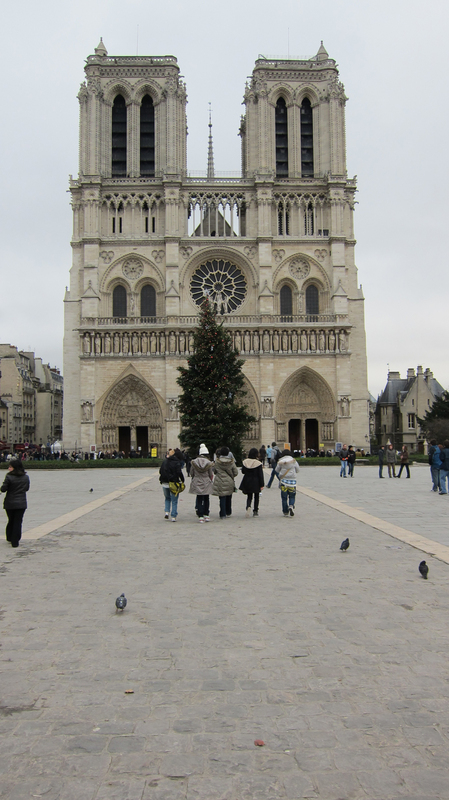 In the square in front of the cathedral today as shown in the image below the outlines of the Rue Neuve Notre Dame are marked out. 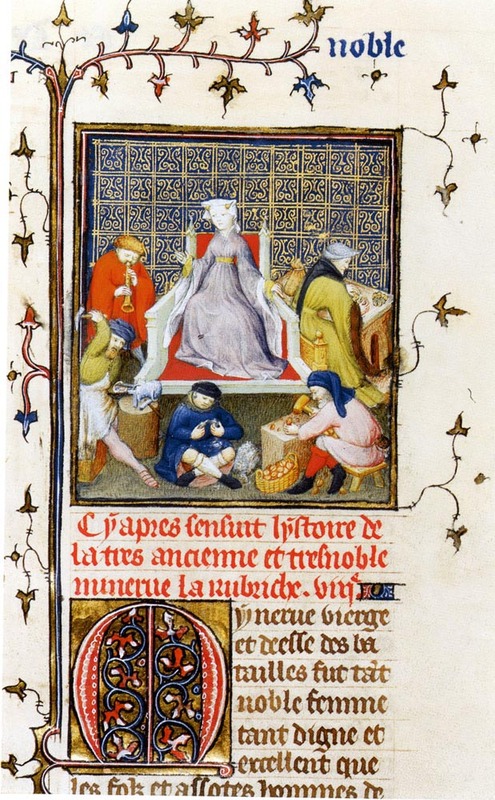 This miniature or painting comes from a French translation of a text written by the fourteenth century Italian author, Boccaccio. 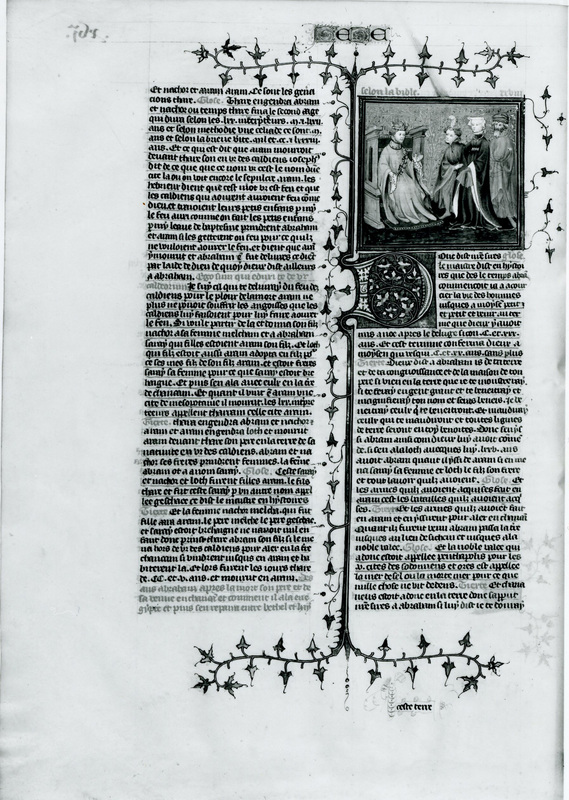 The text is entitled Concerning Famous Women, and this specific copy of the text was made for Philip the Bold, the Duke of Burgundy. 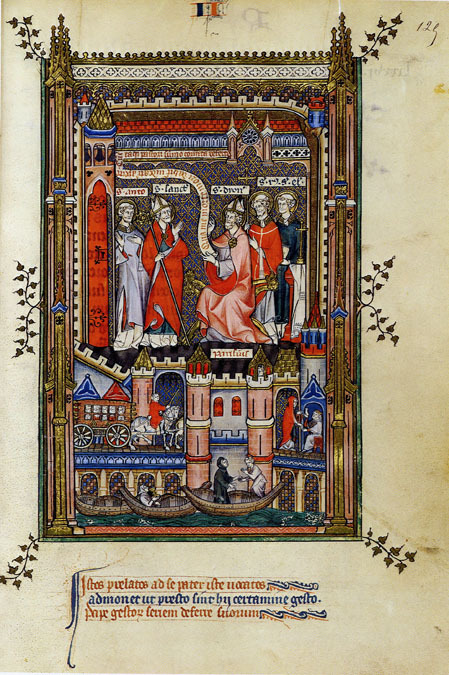 The manuscript now in the Bibliothèque nationale in Paris (Fr. 12420) was given to Philip on New Year's Day of 1403 by an Italian merchant by the name of Jacques Rapondi. 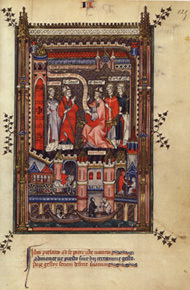 The specific miniature opens the text devoted to the Roman queen Gaia, the wife of King Tarquinius. 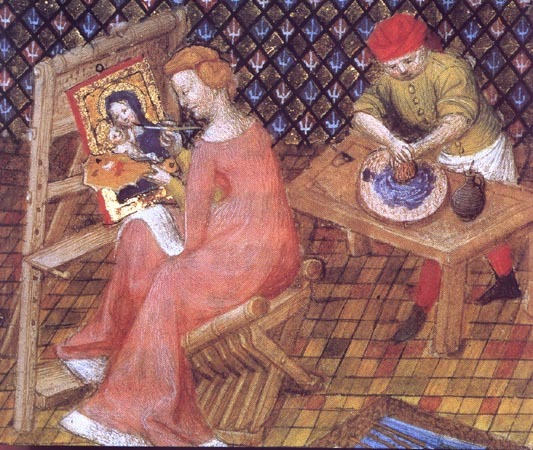 While illustrating Gaia's attention to domestic occupations, the miniature can be used to give us insights to the workings of medieval industries. 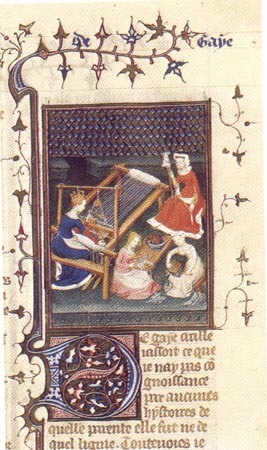 Here the miniaturist has represented the different stages in the production of cloth with the combing and carding of wool at the bottom right and the spinning of the wool above. Gaia is at the loom weaving the wool. 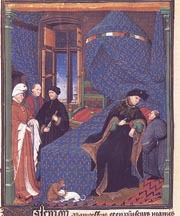 The production and marketing of cloth played a central role in the economic resurgence in the later Middle Ages. Italian merchants like Jacques Rapondi gained great prosperity through the selling of cloth produced in Italian towns like Florence and his native Lucca to aristocrats of northern Europe. Study of the cloth industry reveals the clear subdivision of production into separate specializations. The industry depended on the coordinated efforts of these independent specialists. To work collaboratively was clearly essential. The choice of this format by the planner of the Boccaccio manuscript was to associate it with a particular category of books. Encyclopedias, philosophical texts, and historical works regularly conform to this format. 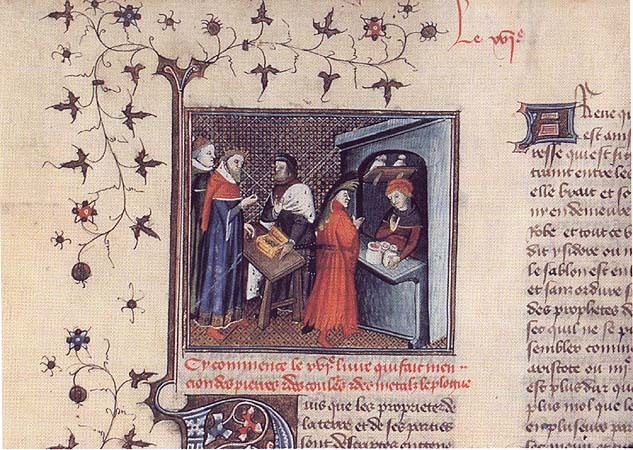 Production of books like the Boccaccio manuscript depended on the work of discrete specialists. A scribe first wrote out the text. Although careful examination of the book shows that two different scribes transcribed this text, the general impression is uniformity. Scribes were trained to write specific types of scripts. The Gothic textual script used here is, like the layout, standard for this type of text. The book was then decorated. 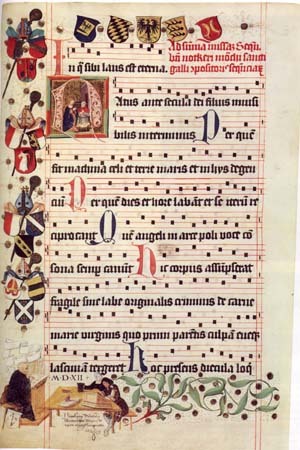 The format of the initials and border decoration is again standard for the period. While closer examination shows that at least three different decorators contributed to this manuscript, the integrity of the book as a whole depended again on standardization. [For a study of the career of an individual decorator active in the Paris book industry see my paper entitled Considering a Marginal Master.] 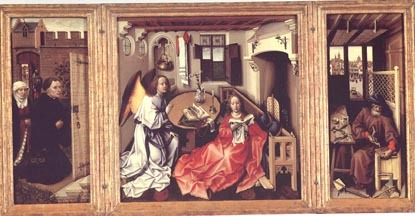 Separate miniaturists would then be responsible for the painting of the illustrations. This workshop structure was typical of late medieval craft production. 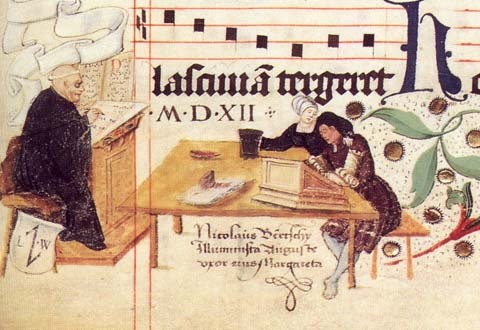 In Women, Production, and Patriarchy in Late Medieval Cities, Martha Howell writes: "The system of medieval craft production...promoted producer autonomy, rough equality among members of a craft, and, above all, shared control of the resources of production and sale [p. 34]." Capitalism offers a very different model. In her study, Howell identifies as the crucial break between the pre-capitalist and capitalist economy the point when merchants "transformed themselves into merchant-producers by taking over the production functions once carried on by independent producers [p.35]." The autonomy of individual craftsmen was lost when they became wage laborers. They no longer had control of production and sales. Another consequence of this shift was the separation of the work and domestic spaces. It is striking the number of images that come from the fifteenth century of images of the artisan. These articulate the social position of the artist. 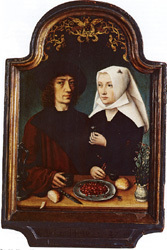 One such painting is the image of the Goldsmith signed by Petrus Christus and dated 1449 in the Metropolitan Museum of Art. The painting was for a long while seen as a representation of St. Eligius, the patron saint of the gold- and silversmith and jewelers guild. A recent restoration has shown that a gold halo was a nineteenth century addition. 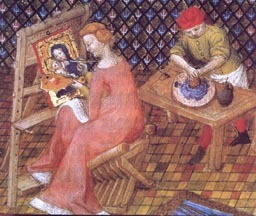 Whether the image is a portrait of a specific goldsmith is unclear, but the painting can be used to articulate the occupation of the goldsmith. 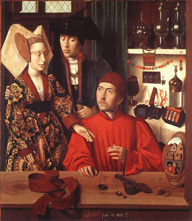 Here we see the craftsman seated at the front window of his shop negotiating with a young couple over the price of a wedding ring that the goldsmith weighs in the balance. The juxtaposition of a set of weights with a stack of coins situates the exchange in the context of monetary value. The high social standing of the young couple, probably noble, is articulated by their dress, especially with the rich gold brocaded dress of the woman and collar worn by the man which is possibly a sign of membership in a noble order. The cap and simple garment of the goldsmith are typical of images of the artisan of the period. 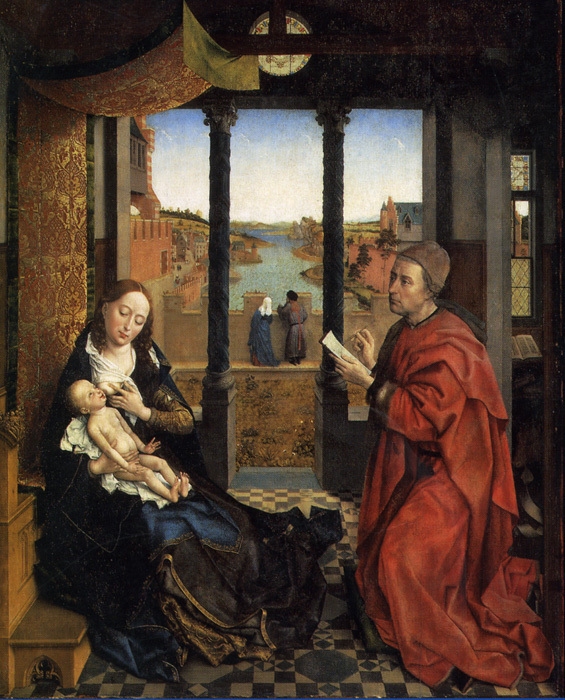 Compare this with the clothing of St. Luke in Rogier van der Weyden's St. Luke Drawing the Virgin in Boston. 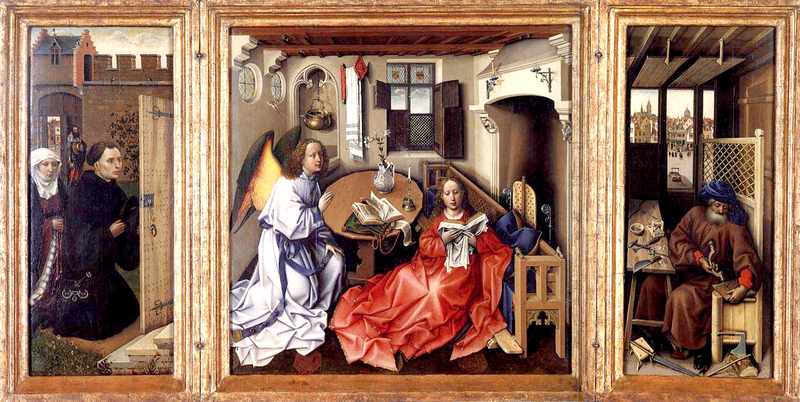 St. Luke is treated here as the patron saint of the artist's guild or the guild of St. Luke.If the painting is not an actual self-portrait of Rogier van der Weyden, it is at the very least an image that the fifteenth century painter would have clearly identified with. Rogier's painting is as much occupational as devotional. The fur-lined, scarlet gown worn by the goldsmith in the Christus painting is a clear sign of the craftsman's economic prosperity. 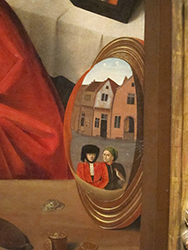 Returning to the Christus painting, the mirror in the lower right corner articulates the urban context of the workshop as prospective customers approach the shop window. The man in red in the mirror is a member of the nobility. 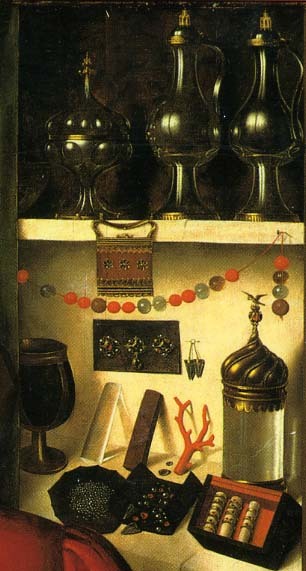 This is suggested by his apparent servant next to him who holds onto the nobleman's hawk.The objects on the shelves on the right hand side of the painting articulate the different facets of the goldsmiths trade. The quality of the craftsman's manufacture is demonstrated by the presumably pewter vessels on the top shelf. The pair of identical pitchers attest to the craftsman's ability to maintain standards of production. Part of the goldsmith's trade was the sale of precious materials. These are enumerated by the objects on the lower shelf which include sharks' teeth, a heap of pearls, a stalk of coral, and blocks of crystal and porphyry. There is also a curious goblet which appears to have been made out of coconut shell. The intrinsic costiliness and exoticism of these objects need to be understood in the context of the prestige of luxury materials in fifteenth century taste. This is especially true of aristocratic patronage which put a heavy emphasis on the intrinsic value of the materials including gold, silver, gems, ivory, and other rare and exotic materials. Nobility articulated their social standing through the magnificence and preciousness of their possessions. Just as the Goldsmith is about the goldsmith trade, it can also be seen as relating to painter's trade. While representing precious objects, the Petrus Christus painting itself has little intrinsic value. What it foregrounds is the artist's ability to create semblances of these precious materials. Here Petrus Christus follows the lead of his teacher Jan Van Eyck. 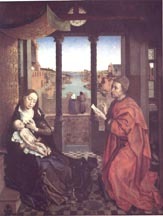 In paintings like the Rolin Madonna, Van Eyck captures the taste of aristocratic patronage, but again the value of these paintings is not in their intrinsic worth but in the artist's ability to create illusions of the jewels and precious materials associated with the magnificence of the nobility. Van Eyck and Christus thus paint surrogates of the luxury objects. 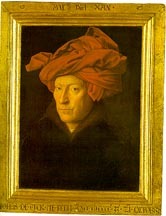 While Van Eyck was the court painter for the Duke of Burgundy, it is significant that his extant paintings were not made for the duke or members of the Burgundian nobility but principally for the bourgeois members of the duke's court. 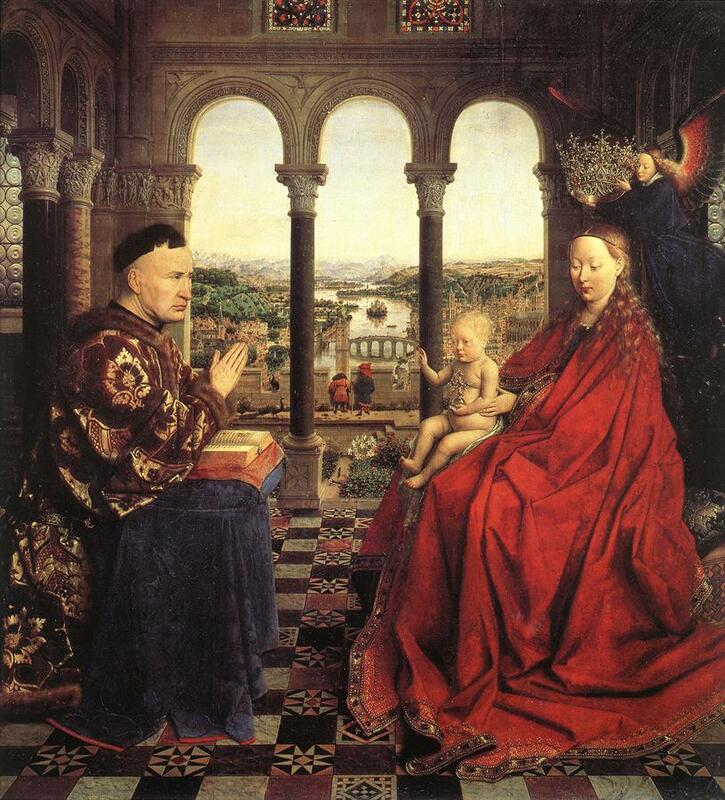 Whereas noble patronage put a heavy value on the intrinsic worth of materials, the bourgeois patronage associated with Van Eyck puts an emphasis on the artist's ability, which parallels his bourgeois patron's status which was based on personal merits and ability and not issues of birth. 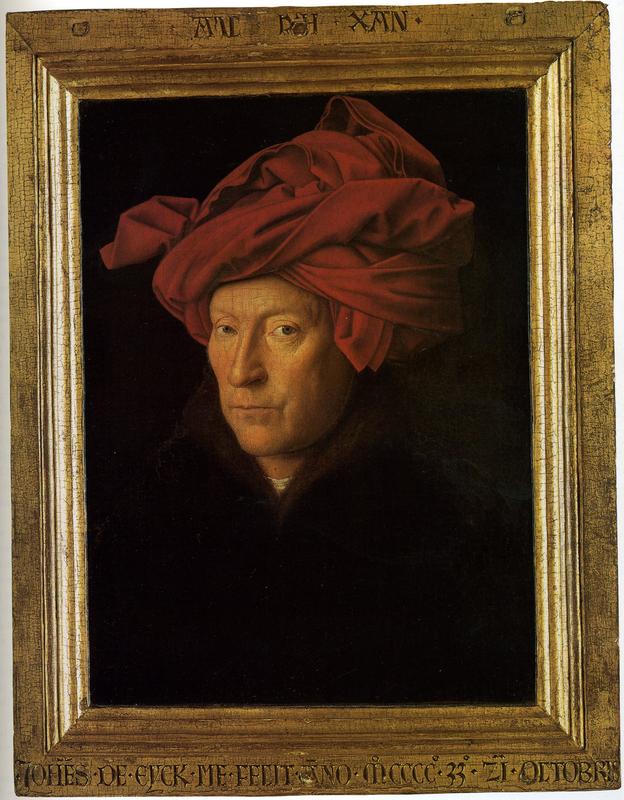 It is this emphasis on ability that explains the motto van Eyck incorporates into his frame of the so-called Man with the Red Turban. Understood frequently as a self portrait, the painting's motto reads: "ALS IXH XAN." With its obvious play on the name of van Eyck/IXH, the motto can be translated: "As best I/Eyck can." While calling attention to his ability, the motto can also be seen as van Eyck as court painter emulating the practice of the nobility who adopt personal mottos to articulate their identity. In the Goldsmith, Petrus Christus appears to be following his master's lead and foregrounds his ability. 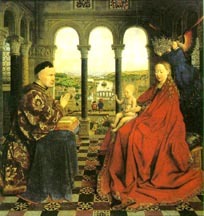 Petrus Christus's signature at the bottom of the painting situates his work in a different social context from that of Jan van Eyck. While the latter's identity was clearly understood in his role as a member of the duke's household as court painter , the signature situates the work of Petrus Christus in the context of the urban craftsman much like the goldsmith he represents. Written in a batarde script, the signature reads "m petr xpi me**fecit*a 1449" or "Master (Magister) Petrus Christus made me, A.D. 1449." The signature is followed by a heart shaped device. The batarde script, used in administrative and commercial contexts, plus the identification of Christus as Master places the work in the context of guild manufacture. The heart shaped device can be identified as like the trademark employed by a goldsmith. Comparable signs were used in the Bruges manuscript industry to identify the work as by a registered member of the guild of Saint Luke. 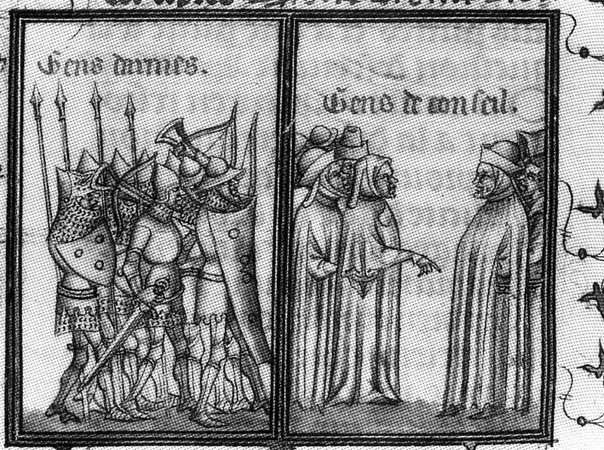 The example on the left comes from the Guildbook of the Corporation of Painters and Saddlemakers in Bruges. The painting is thus understood as a product of guild manufacture. It is legally sanctioned as a commodity of exchange in the commercial context of the medieval guild system. A double portrait dated 1496 by the Master of Frankfurt, active in Antwerp, was apparently painted as a display or advertisement of the artist's skills to his rich clientele. The inclusion of his wife attests to the nature of the workshop as a household economy in which the husband and wife share in the responsibilities of managing the workshop. 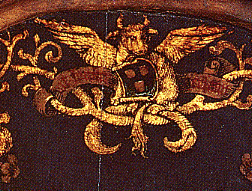 The arms of St. Luke and motto (Wt Jonsten versamt ("gathered from joy")) at the top of the picture attests to his membership in the Antwerp Guild of St. Luke. Their moderate prosperity is indicated by their fashionable but not ostentatious clothing. He wears a woolen, fur-line gown. 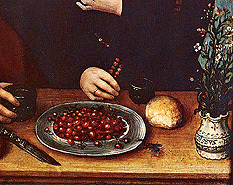 His wife holds in one hand a coral bead Rosary, attesting to her piety, while in her other hand she presents her husband what has been identified as stock-gillyflowers which was associated with the painter's guild which in 1480 had merged with the Chamber of Rhetoric known as "De Violeren" ("The Stock Gilly-Flowers"). The ceramic vase, pewter plate, and knives with wooden handles are appropriate to their economic status. The artist's ability is attested to by the flies that alight in the area of the painting of the wife's veil and by the plate of berries. This is perhaps an allusion to an anecdote about Giotto and Cimabue as recorded by Filarete: "And we read of Giotto that as a beginner he painted flies, and his master Cimabue was so taken in that he believed they were alive and started to chase them off with a rag" (Francis Ames Lewis, The Intellectual Life of the Early Renaissance Artist, p. 192). This story echoes the famous account in Pliny in which a painting by Zeuxis of grapes fool birds who attempt to eat them (Pliny, Natural History, 35, 65-6). It is significant that in the painting by the Master of Frankfurt, the illusion is that flies are landing on the surface of the panel. The painting thus challenges us to determine where our reality ends and the painting's reality begins. 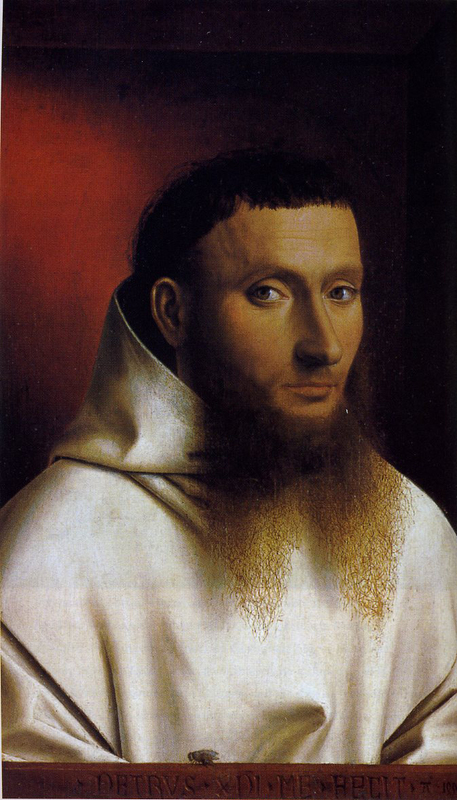 Petrus Christus possibly made a similar reference to the story of Zeuxis with the fly that has landed on the fictive ledge at the bottom of his Portrait of a Carthusian in the Metropolitan. 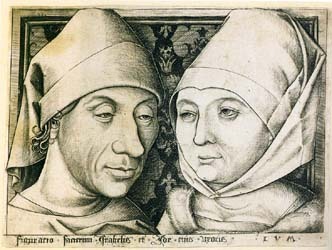 Dated about 1490, the print represents the artist with his wife Ida and can be seen as a statement of partnership of the husband and wife managing a successful workshop specializing in the production print copies of the works of other engravers. Of the over 600 signed prints by Israhel, 90% of them can be identified as being based on the work of others. 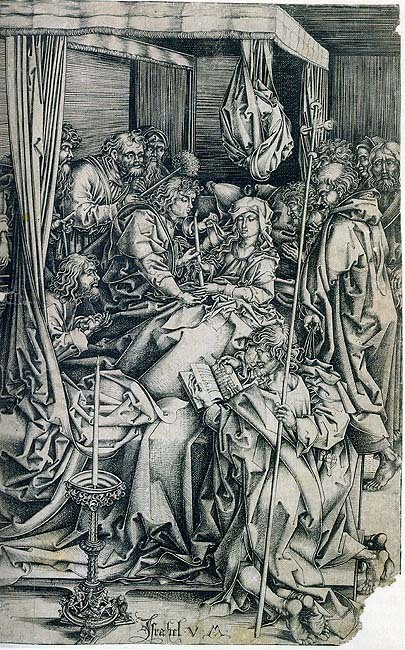 58 of his prints, for example, copy the work of Martin Schongauer. 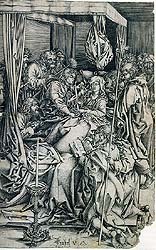 In their important study The Renaissance Print, Robert Landau and Peter Parshall make the claim that Israhel van Meckenem "can be counted as the most historically important northern printmaker at work around 1500 (pp. 56-57)." This seems to us an odd claim when we consider the apparent lack of originality of Israhel van Meckenem's work, but Landau's and Parshall's point has merit when the wide dissemination of his work is considered. He saw the potential of marketing prints as a commodity. 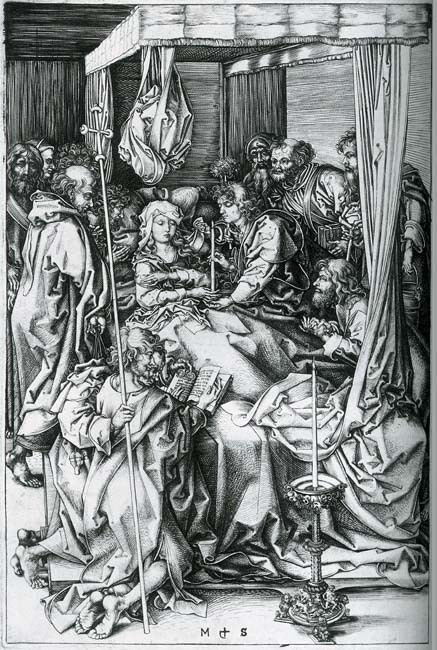 Martin Schongauer, Death of the Virgin, c. 1480, engraving. 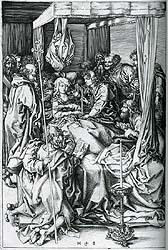 Israhel van Meckenem, Death of the Virgin, c. 1490-1500, engraving. Making a marketable commodity was thus the priority of Israhel van Meckenem's shop over originality. The engraved double portrait served to advertise the van Meckenem shop. Sculptor's Workshop. c. 1416, commissioned by the Arte dei Maestri di Pietra e Legname from Nanni di Banco for the base of the guild niche at Orsanmichele. The image reflects attitudes about the nature of artistic practice similar to those expressed in Cennini's Craftsman's Handbook. 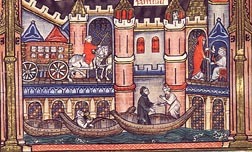 Cennini was born about 1370 near Florence. He was a pupil of Agnolo Gaddi, who had been a pupil of Taddeo Gaddi, who in turn was a pupil of Giotto. 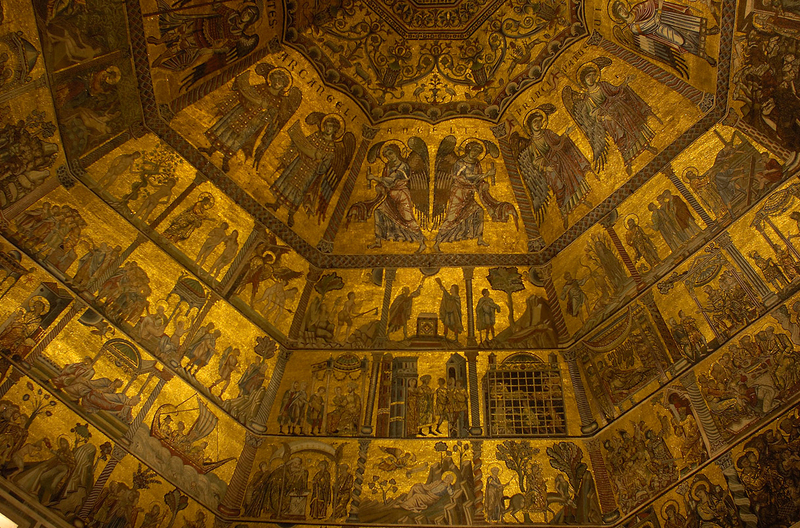 Thus Cennini is a direct artistic descendent of Giotto and the inheritor of the traditional practices of the fourteenth century Italian art workshop. A translation of the complete text is available on the web. 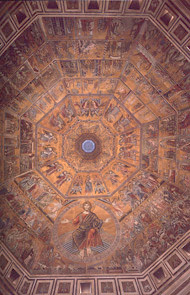 Last Judgment on the ceiling of the Baptistry in Florence. 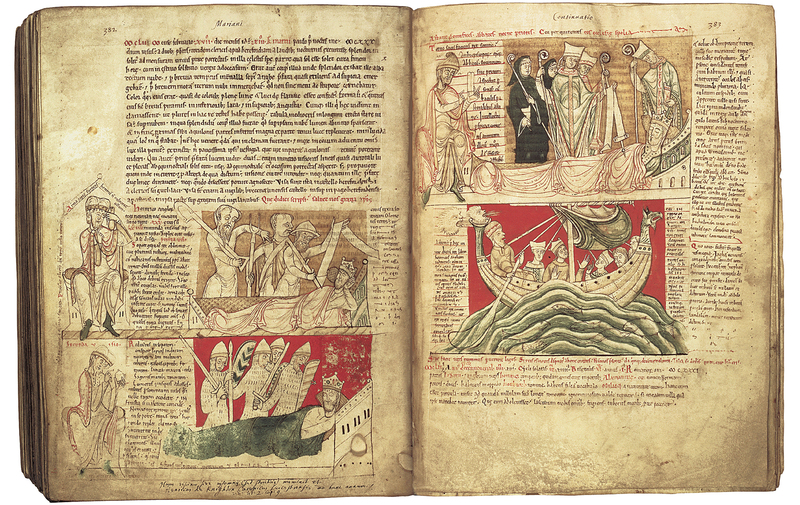 Attributed to Coppo di Marcovaldo and dated to the second half of the 13th century. Scenes from the Old and New Testament also appear including Creation scenes from Genesis and scenes from the life of Christ and John the Baptist. 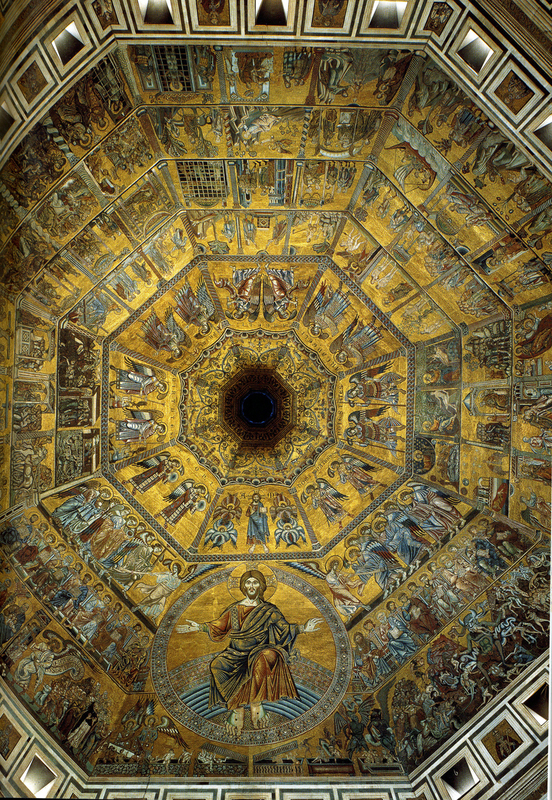 All Florentines up until relatively recent years would have been Baptised under this mosaic dome. Through Baptism they would become members of the church and become Florentines. Here begins the craftsman's handbook, made and composed by Cennino Cennini of Colle, in the reverence of God, and of the Virgin Mary, and of Saint Eustace, and of Saint Francis, and of Saint John the Baptist, and of Saint Anthony of Padua, and, in general of all the Saints of God; and in the reverence of Giotto, of Taddeo, and of Agnolo, Cennino's master; and for the use and good profit of anyone who wants to enter this profession. It is not without the impulse of a lofty spirit that some are moved to enter this profession, attractive to them through natural enthusiasm. Their intellect will take delight in drawing, provided their nature attracts them to it of themselves, without any master's guidance, out of loftiness of spirit. And then, through this delight, they come to want to find a master; and they bind themselves to him with respect for authority, undergoing an apprenticeship in order to achieve perfection in all this. There are those who pursue it, because of poverty and domestic need, for profit and enthusiasm for the profession too; but above all these are to be extolled the ones who enter the profession through a sense of enthusiasm and exaltation. You, therefore, who with lofty spirit are fired with this ambition, and are about to enter the profession, begin by decking yourselves with this attire: Enthusiasm, Reverence, Obedience, and Constancy. And begin to submit yourself to the direction of a master of instruction as early as you can; and do not leave the master until you have to. The basis of the profession, the very beginning of all these manual operations, is drawing and painting. These two sections call for a knowledge of the following: how to work up or grind, how to apply size, to put on cloth, to gesso, to scrape the gessos and smooth them down, to model with gesso, to lay bole, to gild, to burnish; to temper, to lay in: to pounce, to scrape through, to stamp or punch; to mark out, to paint, to embellish, and to varnish, on panel or ancona. To work on a wall you have to wet down, to plaster, to true up, to smooth off, to draw, to paint in fresco...the next thing is to draw. You should adopt this method. Having first practiced drawing for a while as I have taught you above, that is, on a little panel, take pains and pleasure in constantly copying the best things which you can find done by the hand of great masters. And if you are in a place where many good masters have been, so much the better for you. But I give you this advice: take care to select the best one every time, and the one who has the greatest reputation. And, as you go on from day to day, it will be against nature if you do not get some grasp of his style and of his spirit. For if you undertake to copy ofter one master today and after another tomorrow, you will not acquire the style of either one or the other, and you will inevitably, through enthusiasm, become capricious, because each style will be distracting your mind. You will try to work in this man's way today, and the other's tomorrow, and so you will not get either of them right. If you follow the course of one man through constant practice, your intelligence would have to be crude indeed for you not to get some nourishment from it. Then you will find, if nature has granted you any imagination at all, that you will eventually acquire a style individual to yourself, and it cannot help being good; because your hand and your mind, being always accustomed to gather flowers, would ill know how to pluck thorns. Mind you, the most perfect steersman that you can have, and the best helm, lie in the triumphal gateway of copying from nature. And this outdoes all other models; and always rely on this with a stout heart, especially as you begin to gain some judgment in draftsmanship. Do not fail, as you go on, to draw something every day, for no matter how little it is it will be well worth while, and will do you a world of good.